It was some day at the World Championship! Team Unicorn stars Gary Anderson and Dimitri van den Bergh were both worthy winners, but veteran star Paul Lim so nearly stole the show. Gary beat Lim 4-1 but the 63-year-old came agonisingly close to more darting history. 28 years after his history-making 9 darter at the BDO World Championship, Lim just missed D12 to repeat the feat at the Alexandra Palace on Friday night. After Gary raced into a two set lead, winning all six legs, but in the final leg of that second set Lim so nearly claimed darts’ holy grail again.....177, 180, T20, T19 and just fell shy of the D12. Lim took the third set before the Unicorn star raced away with it winning six straight legs to go through to round three. 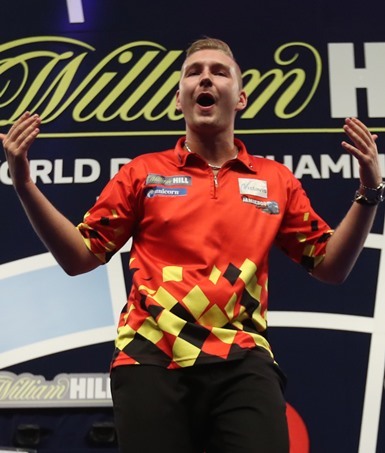 And take a bow Dimitri van den Bergh! The talented young Unicorn star has reached the last 16 at the Ally Pally for the first time. He was superb seeing off Jan Dekker by four sets to two and will now face Mensur Suljovic on December 28 for a place in the quarter-finals. Suljovic beat Robert Thornton 4-2, hitting a 121 finish on the bull to win the match. The first couple of sets were shared, but the young Belgian was focused. In the third set, he took out 108 and 126 and he was flying. A crucial 95 finish was pivotal as he moved three sets to one in front and at that stage he’d hit 10 doubles from only 14 attempts. Dekker fought back to take the 5th set, but there was no denying the Unicorn starlet. He was brilliant in that 6th set to win it. First there was a 171 and 14 darter, then a fifth 180 and a 165 and then came a 6th 180 and D7 to wrap up the biggest victory of his young career. Ian White's World Championship came to an abrupt halt as he was stopped in his tracks by Gerwyn Price. He just never got into the match as the Welshman dominated from the off. Price took out 102 and 114 in winning the opening set and despite a superb 151 finish from the Unicorn man in set two, Price won it with a 12 darter. Crucially White lost the opening leg of the set after busting 121. White did get on the board as he won set three, but it was brief respite. Price won five of the next six legs to sweep to victory and a place in the last 16 for the first time. In what turned out to be the final set, White was helpless as his opponent hit a 174, a 7th 180, an 86 check-out and then a 97 finish to clinch it. Elsewhere on Friday, defending champion Michael van Gerwen whitewashed James Wilson 4-0 as he won 12 straight legs. On Saturday Michael Smith, Keegan Brown and Kyle Anderson take centre stage for Team Unicorn in round two. All are involved in cracking ties. Smith takes on Rob Cross and Brown has a great chance to make the last 16 against Zoran Lerchbacher, while Kyle faces Raymond van Barneveld in the last match before the Christmas break.